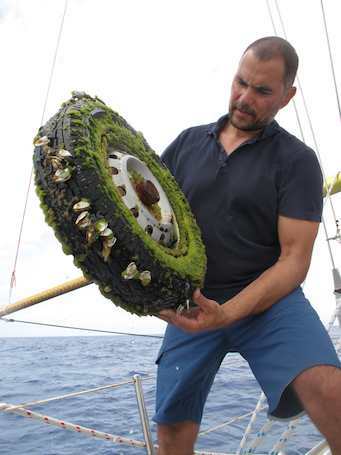 Marcus Eriksen holds a Bridgestone tire covered in algae, gooseneck barnacles and small golden crabs found in the Japanese tsunami debris field. On Tuesday afternoon I awoke suddenly when I heard the rumble of feet and the crew shouting, “we have to turn around!”I grabbed my camera and ran on deck to see Tracey, an entrepreneur from Hong Kong, pointing toward a black speck in the distance—a floating tire. Rodrigo, our captain, turned the boat around and Marcus grabbed a mesh pool skimmer and stood at the front of the boat, straining his eyes to look for the bobbing black object. I thought we’d never find it again but with the entire crew on deck we spotted it and Marcus leaned precariously over the port side of the boat to heave the tire on board. Water poured from the tire and small golden crabs fell from the floating piece of rubber. The rusted metal rim revealed the tire’s origin: made in Japan. Although it’s impossible to definitively trace the tire back to the tsunami, those three words are extremely telling. If it was made in Japan it’s possible the tire was in the country before the tsunami hit. It’s still inflated and only slightly rusted, which means it probably hasn’t been in the water for more than a year or two, which puts it within the time frame of the tsunami. The bearing cap is still on the rim, which means it was probably fitted to a car at some point, probably a truck as the rim says, “light truck.” This is the largest piece of debris we’ve hauled on board and we have five or six more days in the debris field before we head south for Hawaii (I’ll update you on some of the other things we found in another post). As I write this Jesse, the ship’s first mate, is cooking Mahi Mahi on the stove; he caught the fish about an hour ago and the smell of butter and herbs is warming the air. With twelve people on board and a diminishing supply of fresh food, the white fish will be gone within the hour.